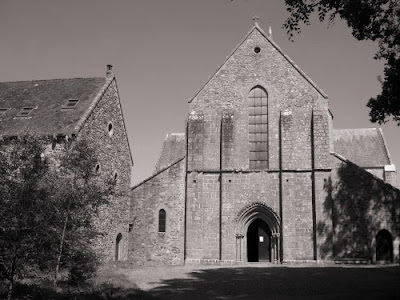 is a perfect description of the Cistercian L'Abbaye de Boquen in Brittany, which is seen in my photos below. 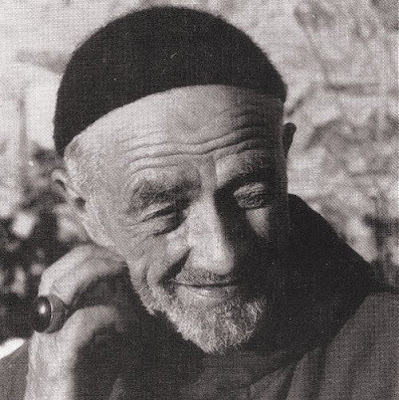 But those words also apply to the riveting archive image above which depicts Dom Alexis Presse (1883-1965) who was responsible for the 20th century restoration of the ancient Abbey. L'Abbaye de Boquen was founded in 1137, and at its peak housed a community of more than a hundred monks. My photos show the Abbey church which is a classic example of French Romanesqe style with later influences. From the 16th century the Abbey fell into decline and when the French Revolution brought an end to monastic orders only the prior and three monks remained. In 1790 the abbey was sold into private hands. The property then became a stone quarry and great damage was done to the priceless buildings when they were used a source of building stone. In 1936, after 145 years of neglect, Dom Alexis came to live in the derelict Abbey, and began to restore the buildings and create a new community living to the Cistercian Rule. The miraculous restoration of L'Abbaye de Boquen was literally Dom Alexis' life work. 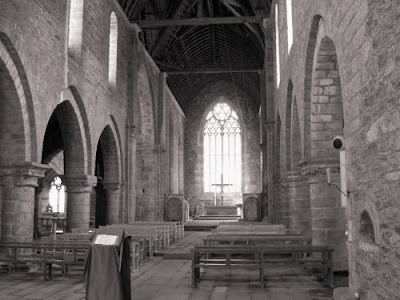 In August 1965 the Abbey, lovingly restored to the condition seen in my photos, was reconsecrated. But Dom Alexis was so exhausted by his labours that he had to be brought to the consecration service on a stretcher, and he died just three months later. Sadly, that was not the end of the struggle for continuity at the Abbey. Without Dom Alexis' inspirational leadership the fragile community disintegrated, and it looked as though Boquen would suffer the fate of so many great sacred buildings in France and simply become a historic building on the tourist trail. But in 1976 a community of nuns of the Order of Bethlehem, the Assumption of the Virgin and Saint Bruno settled at Boquen, and they continue a precarious existence there today. The recently formed order practise an eremitical lifestyle and follow an Eastern-influenced liturgy derived from the Egyptian beginnings of Christiam monasticism. Timeless purity, peerless beauty, and spiritual ambiance pervade the etheral sounds of John Coltrane's music. The great conductor and composer Igor Stravinsky's music was also timeless, ageless, and ever-new in sound, purity and ambiance. Both men lived in the twentieth century; and yet in this new millenium, their music is more than a recall to memory, because after the passage of many decades it is refreshing to hear their compositions and recorded performance of excellence. Alice Coltrane wrote those words for the 2001 compilation Spiritual which showcases the increasingly religous direction that John Coltrane's music took. 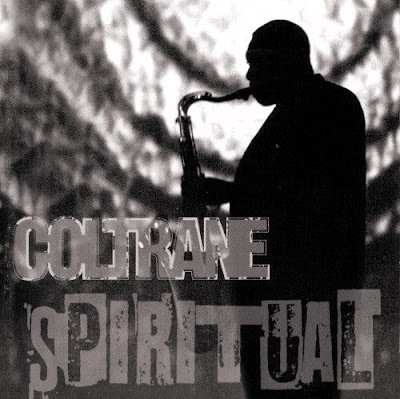 I am ambivalent about compilation discs, but Spiritual does work as an organic whole, and it is a tempting way to avoid some of Coltrane's later improvisatory longueurs. It is still in the catalogue in both in CD and download formats. 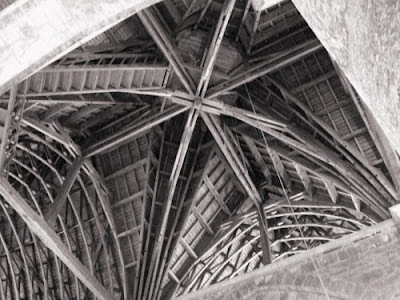 If the connection between music and place has any validity my first choice for L'Abbaye de Boquen would be the timeless sounds of silence; but as a second choice John Coltrane's Spiritual cannot be bettered. John Cage meets Trappist nuns here.